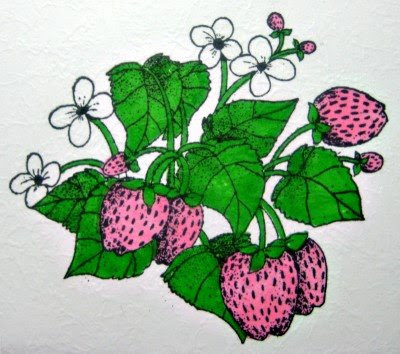 A strawberry card on someone else's blog (I was hopping...not sure where I saw it) reminded me I had this stamp from My Heart Stamps for You tucked away and inspired me to pull it out the other day. I miss strawberries here...we are actually able to get them but they are pitiful, small, and expensive, and I just can't bring myself to buy them. So I stamp them. Fair enough! Next I added a little colored pencil around the image and blended with odorless mineral spirits, using a blending stump. Next I added darker red to the strawberries, and blended again. After blending, I shaded again with a darker burgundy, and blended the two shades together. The final step was adding white highlights, first with a pencil and then with a gel pen. Here is the final card. The saying is from Impression Obsession...I love all their "sweet" sayings. Your card is beautiful. I'm looking forward to trying your technique when I add more colors to my alcohol marker collection. What a fantastic card!!! Thanks for the step-by-step.....very cool! Wow, the berries look so real! Love the entire design of your card....beautiful!!! This is one sweet card! Loved seeing your coloring process, thanks for sharing the pics of how you do your magic! Dina, this is beautiful. I love strawberries!!!! Thanks for the tutorial! I love my Prismacolors, but I think that my mineral spirits have lost their blending ability. Is that possible? They are several years old. There is a stamp show this weekend and I will get some more. your coloring & shading with 2 items is truly a work of art; do you practise often? Your tutorial is wonderful, and the coloring is absolutely outstanding! I am going to give this a go- God Bless You!!! Thank you so much for sharing your technique with us! Your coloring is fabulous! Your strawberries and leaves look real! Great tutorial and anxious to get out my very few pencils and try them again.